This driver's implementation of JDBC DatabaseMetaData. This driver maps the repository name as the JDBC catalog name. This driver maps REFERENCE properties as keys, and therefore it represents as imported keys those REFERENCE properties on the type identified by the table name. 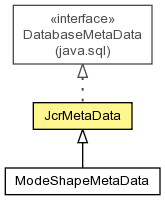 JCR-SQL2 allows identifiers to be surrounded by matching single quotes, double quotes, or opening and closing square brackets. This driver maps REFERENCE properties as keys, and therefore it represents as imported keys those properties on other types referencing the type identified by the table name. There is no maximum length of binary literals (or if there is a limit it is not known), so this method returns 0. There is no maximum length of the catalog (repository) names - or the limit is not known. There is no maximum length of character literals (or if there is a limit it is not known), so this method returns 0. There is no maximum length of column names (or if there is a limit it is not known), so this method returns 0. JCR-SQL2 does not support GROUP BY, so this method returns 0. There is no limit to the number of columns in an index (or if there is a limit it is not known), so this method returns 0. There is no limit to the number of columns in an ORDER BY statement (or if there is a limit it is not known), so this method returns 0. There is no limit to the number of columns in a select statement (or if there is a limit it is not known), so this method returns 0. There is no limit to the number of columns in a table (or if there is a limit it is not known), so this method returns 0. There is no limit to the number of connections (or if there is a limit it is not known), so this method returns 0. There are no cursors (or there is no limit), so this method returns 0. There are no indexes (or there is no limit), so this method returns 0. There are no procedures, so this method returns 0. There is no maximum row size. There is no maximum length of the schema (workspace) names - or the limit is not known. This method returns the effective URL of the connection, which includes all connection properties (even if those properties were passed in via the Properties argument). Assumed to be false for JCR implementations (meaning that sort order IS used), though section 6.7.37 of JCR 2.0 specification says ordering of null values is implementation-determined. Assumed to be false for JCR implementations, though section 6.7.37 of JCR 2.0 specification says ordering of null values is implementation-determined. Assumed to be true for JCR implementations, though section 6.7.37 of JCR 2.0 specification says ordering of null values is implementation-determined. This driver maps the repository name as the JDBC catalog name. Therefore, this method returns 'Repository' for the catalog term. This driver maps the repository name as the JDBC catalog name. Therefore, this method returns a result set containing only the repository's name. JCR-SQL2 allows identifiers to be surrounded by matching single quotes, double quotes, or opening and closing square brackets. Therefore, this method returns a single-quote character as the quote string. This method returns the effective URL of the connection, which includes all connection properties (even if those properties were passed in via the Properties argument). Note that each character in the password is replaced with a '*' character.